Summary: The description, photo, pricing and user ratings for the Crimson Trace Rail Master Universal laser sight. The Crimson Trace Rail Master Universal is a rail accessory laser sight comprised of a polymer housing for all manner of pistols (and rifles). The sight is compatible with any weapon that supports picatinny or weaver based rail accessories. 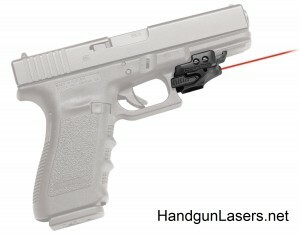 Note: There are multiple versions of this laser sight available that differ in laser color and body finish. One model features a coyote tan cerakote finish, which adds a new color and is designed to protect the rail sight from harmful chemicals. Note 2: Crimson Trace now offers a version of this laser sight, the Rail Master Pro Universal, that includes a tactical light. Crimson Trace says this laser is factory sighted at 50′. You can easily install it yourself. The laser is backed by a three-year warranty. This entry was posted in $101-$150, $151-$200, $201-$250, $251-$300, Crimson Trace, Green, Infrared, Rail, Red on October 17, 2013 by Briley Kenney.